The client’s proposal included an intent to construct an approximate 55,000 SF 3-story office building on a ±12-acre parcel within an existing office park. To prepare a federal wetland delineation report for submission to the US Army Corps of Engineers (USACE) for a Jurisdictional Determination (JD) of wetland limits. 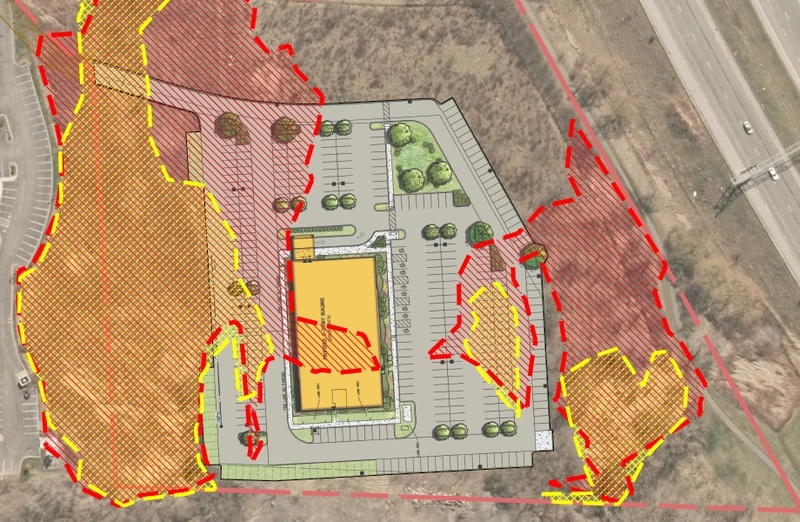 the proposed office building and associated parking, landscaped areas, and stormwater management facilities. In conjunction with the permit application and approval, present the different wetland mitigation options such as in lieu fee credits to local conservation board. The project site was previously proposed (by others) for development of an office building, which was never constructed. A wetland report was prepared (by others) and a JD was issued by the USACE for a total of ±4.93 ac. of regulated wetlands. The proposed project, at that time, required ±1.99 ac. of wetlands to be disturbed. BME was hired by a different developer to prepare an updated wetland report and to request a new JD for the site from the USACE. Successfully challenged the limits of the previous JD, which resulted in ±2.3 acres less of regulated wetlands from the prior JD. BME was also able to negotiate a reduced mitigation ratio of 1:1 as a condition of the wetland permit review and approval. Presented options to the Town of Brighton conservation board to allow the purchase of wetland credits instead of building wetlands on-site, which the Town initially requested, but was not feasible. The original wetland delineation (by others) would have required approximately 1.99 ac. of wetland disturbance for the previous project. In addition, the mitigation ratio could likely have ranged from 1:1 to 2:1, depending on the USACE assessment of the existing wetland value. Utilizing the USACE required $80,000 fee per acre of filled wetland, the cost would have been $238,800 (1.5 x ±1.99 ac. x $80,000/ac.) at a 1.5:1 mitigation ratio. The ultimate permit that BME was able to receive approval for the project included a filled wetland area of 0.64 acres at a 1:1 mitigation ratio, or a total of $51,200. Therefore, the required fee payment reduction resulted in a savings of ±$187,600 as a benefit to the owner. The client’s proposal included wetland delineation and NYSDEC and USACE delineation approvals after wetlands were flagged by another environmental consultant. The ±22-acre property was proposed to be developed for an office building and previously delineated wetlands encumbered the land and limited development. Jurisdictional Determination (JD) of wetland limits. A wetland delineation was prepared (by others). The proposed project, at that time, required ±2.0 ac. of wetlands to be disturbed. BME was able to successfully challenge the limits of the previous wetland delineation, which resulted in ±2.1 acres less regulated wetlands. The original wetland delineation (by others) would have required approximately 2.0 ac. of wetland fill to allow for the project and could have cost the client $360,000 in USACE required mitigation fees. 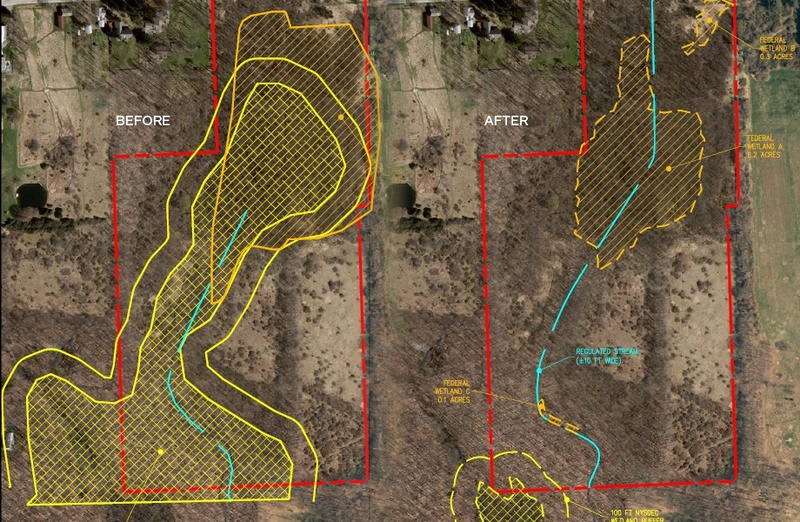 By reducing the wetlands 2.1 ac., BME was able to save their client $360,000 plus an additional 2.0 ac. to build on. acre parcel which, according to available regulatory mapping, was significantly encumbered by state and federal wetland. 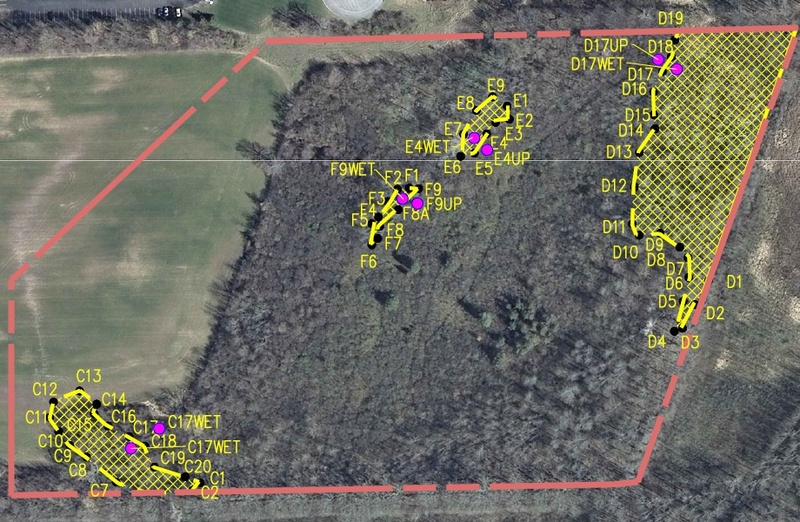 An updated wetland delineation was requested in order to more accurately define the wetland limits—and subsequently the value—of the property for sale. To delineate wetlands limits and request NYSDEC confirmation to assess whether or not it was a NYSDEC regulated wetland. According to existing state and federal wetland mapping, the 40-acre property was almost entirely encumbered by state and federal wetlands. This seriously limited developable area, prevented entrance into the site without a significant permit from state and federal regulating agencies, and potentially reduced property value. The wetlands were reduced enough to remove NYSDEC wetland jurisdiction (below 12.4 acres) which allowed for the removal of an additional 100-foot buffer around the entire wetland. The agency’s mapping showed ±24 acres of wetland and buffer on the parcel. By BME’s delineation and subsequent NYSDEC approval, the encumbered lands were reduced to ±7 acres (a total reduction of ±17 acres). As a result, access to the site was greatly improved without the need for lengthy approval processing.